Queensland Museum Network scientists practice taxonomy - the science of identifying, describing and naming new species. This research has myriad applications – determining habitat health, informing conservation strategies, to enhancing primary industries and for pharmaceutical advancement. 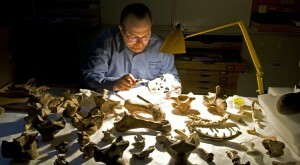 Our scientists at work – Queensland Museum Network palaeontologist Dr Scott Hocknull preparing fossils. Over the past 156 years the Queensland Museum Network has amassed one of the largest and most comprehensive fossil collections in the world. Queensland Museum Network Palaeontologist Dr Scott Hocknull is exploring the Winton Formation in central Queensland. Underneath this seemingly innocuous rock lie the relics of creatures that lived 90-105 million years ago. Creatures like Australia’s carnivorous dinosaur, Banjo and the largest known dinosaurs, enormous titanosaur sauropods Cooper and George. Dr Hocknull’s research strives to fill an enormous gap in our scientific knowledge about what Australia was like during the age of dinosaurs, and in particular, during a period of past global warming, 90-105 million years ago. The marine sponge Stylissa massa. Marine sponges are some of the most vibrantly coloured underwater creatures. There are about 8,500 known species of marine sponge worldwide, and scientists estimate there to be at least that number again awaiting scientific description. Many of these as yet unnamed marine sponges live among the corals and seabed of the Great Barrier Reef. with phenomenal antibiotic and anti-cancer agents. Scientists have successfully isolated a strain of Salinispora that produces anti-cancer compounds significantly less toxic than present cancer treatment. 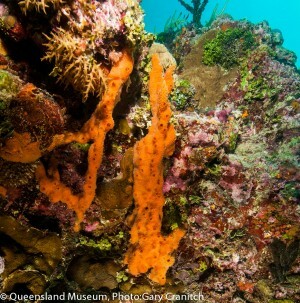 Funds raised by the Queensland Museum Foundation were used to leverage an Australian Resource Council Linkage Grant allowing Queensland Museum Network sponge expert Dr John Hooper and two other marine biologists from the University of Queensland to research map the distribution, diversity and genetic structure of Salinispora living in Australian marine sponge species, allowing the species to be cultivated for use in pharmaceutical products.